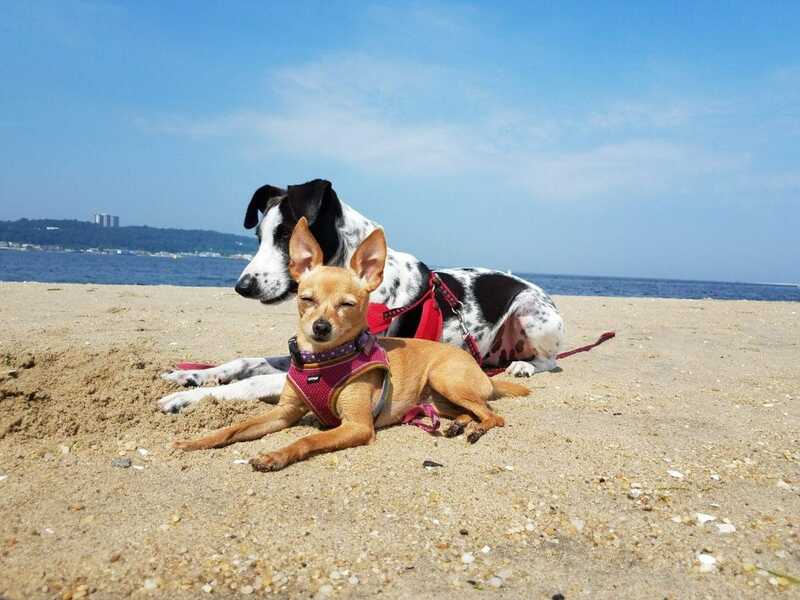 Matilda and Cow have gotten good at listening and staying close to me at the dog beach, with or without a leash. In your living room, your dog does an array of fantastic tricks, comes when you mutter her name under your breath, and always follows you around, anticipating the next game or treat. Outside, she’s a totally different dog. She doesn’t listen to anything you have to say – but a rustling leaf never fails to get her attention. She won’t so much as sit without a ton of repetition, pleading and negotiation. And you’re lucky if she comes the third time you call her – only after she’s finished investigating a patch of grass. There’s two things I’m reminded of when my dogs are so engrossed in the environment that I cannot get their attention. First, I think of the fact that the human body sends 11 million bits per second to the brain for processing, yet the conscious mind seems to be able to process only 50 bits per second. Maybe not in those exact terms, but it’s amazing how much information is all around us, and how little mental bandwidth we have to process it all. So, we learn to filter out the information that’s truly important. And we’re not perfect at it. I checked my email and Facebook 200 words into writing this article, even though I’m quite aware that giving into distractions makes a simple article take much longer to write. My point is, we humans spend our whole lives surrounded by an extraordinary amount of information, and we never completely learn to zero in on what’s important. How can I expect my dogs to perfectly filter out millions of bits of information at just 3 years old, with a canine mind that processes a rich world of scents and sounds that I could never begin to imagine? Here’s the second thing I think about: a yo mama joke. Yo Mama’s so cheap, she can’t even afford to pay attention. This is a double-whammy: a yo mama joke and a pun. But is attention really a currency, a limited resource? Certainly! Especially for dogs. If we want our dogs to pay us their precious, valuable attention, we must work at it. You can’t expect your dog to come when called moments after you let her off-leash at a crowded dog park for the first time in her life. There are butts to sniff. You have to start small and easy. Don’t even start training your dog in public right away. Start in your backyard. If you always let your dog out, without going outside with her, she won’t realize that you still matter when she’s outside. Humbling, but true. When she’s outside doing dog things, surprise her by bringing her a picnic, even if it’s just her bowl of kibble – though a bowl of homemade BARF diet would be nice! Train outside for a few minutes each day. Soon, she’ll start paying more attention. But don’t just train. Play. If she likes to play with toys, some balls and plushes that you’ll only use outdoors, and put them away when you’re done. Don’t let her play with them inside. Run around like a maniac, and give her a treat when she catches you – or reward her by falling to the ground and letting her lick your face. Try some simply nosework games outside. In short – BE INTERESTING. After you’ve worked on the steps above for a few weeks – or a few days, if she’s really getting the hang of it – go to the park. Not a dog park, dog beach, or anywhere she’d be off-leash. Go to a regular human park. Don’t stress over perfect leash manners, or even getting her attention. Give her plenty of opportunities to sniff and get her bearings. Allow her to become familiar with the environment. Stop and start, change directions and run in zig-zags. She should be wearing a comfortable harness, not a collar clipped to her leash – you don’t want to jerk her around. You want to be so interesting that she has to pay attention to you to keep up. As with most things, the results vary on the dog. Most dogs enjoy running. Take care not to let your dog overheat, especially in the summer and/or you have a brachycephalic dog like a pug. Bring water. Again, use toys, treats and games to engage your dog, but don’t force it. You need to bring your dog to the park often, and keep up with the games and activities, to get her used to listening outside, even in public. As your dog gets pretty good at paying attention to you at home and on-leash in public, you can begin to take her to public, off-leash destinations like a dog park or dog beach. Dog parks and dog beaches are controversial because you and your dog will be surrounded by strangers. You don’t know if the people are going to watch their dogs, if they have control over them, or if their dogs might be pushy or aggressive. Sometimes, your dog will meet fun playmates, but you have to be her advocate. You have to keep an eye on her constantly. Keep your phone in your pocket. I like to go to the dog park or dog beach before noon. There’s always a few dogs, but it’s not overwhelming. If a playful puppy starts annoying my dogs, we can easily distance ourselves. But they can still choose to play with other dogs on occasion. When teaching your dog to listen at a dog park, you definitely need to go during off-peak hours. Again, let your dog play with other dogs and do her own thing. Odds are, she’ll actually choose to engage with you when she’s ready, and for that, you can reward her with her favorite games, toys and treats. Your dog isn’t always going to choose you over the environment. Punishing her, or even changing the tone of your voice will give her even more of a reason not to pay attention to you outside. If your dog isn’t paying attention, but she’s otherwise safe, try hiding. See how long it takes for her to look for you – when she does, shower her with affection. She’ll learn that it’s a good thing to keep an eye on you! Don’t let your dog off-leash in a risky situation. There’s no need to test her attention span near a busy road or a group of questionable dogs. It’s better to have a spacey dog that needs a leash than a dead dog. 1: I always find it a good idea to run around and play with my dogs BEFORE starting any training – including their attention. I have one of these flirt poles (copy and paste this into Amazon: Squishy Face Studio Flirt Pole) that my dogs can chase and get rid of that first layer of energy. Once they have used their excess energy, they’re much more responsive to training. 2: Also, if your dog ignores your commands for getting their attention or recalling, I’d change the command word as your dog has been conditioned to ignore those commands through habit. So start training with new commands. Fabulous ideas, thanks Ben! Especially #2, their recall improved after I started whistling, instead of calling by name all the time, the sharp whistle gets their attention. I have used the “hide” trick with great success! I practice it at home where I am lucky enough to have a large yard with lots of hiding spaces. I have a special whistle I use for recall, and I have a puppy party every time they find me. I moved to doing recall work off leash during off hours on a nearby hiking trail. It was a low risk environment that was novel enough to be challenging, but without much chance of running into other dogs. I would emphasize one of the important points you made in your post. If you already know your dog is not going to come because they are too into what they are doing, don’t use your recall. Go to them, get closer, and use something that is more interesting. Every time you use a recall and your dog ignores it, you are wearing it out. Also, I was taught to never, ever, punish or be stern with a dog in association with your recall. It should always be positive…and as you pointed out in this post…preferably more interesting than what you pulled them away from. Having a strong recall can be a life saver in an emergency situation. Thanks for covering this important subject. Great article! I’m currently in the process of training my dog to be my responsive off leash. We started in the hallways of my apartment building, and we just started working outside. One of the biggest things that helped me was attempting to make the training fun! Made such a big difference. My Winston is a door-dasher. When he gets out he runs like he’s being chased by fire. It’s terrifying for me. But when we take him to the dog park and let him off-leash, he just sits down and basks in a sunny spot. I swear he does it on purpose just to irritate us! Cherri Megasko recently posted…Wolves Are Important to the Ecosystem. Yes, it becomes so fast life… we need a companion who can be with you when you really needed. I would go for the dog, as they truly are with you all time without change in love it has. Lindsay great article! It took us a couple of years to train our dog outside, she would just get sooooo excited to be out of the house. Now we can take her on hikes without a leash and she stays right next to us with voice commands. Thanks for the article. This makes me want to go outside right how with my girls and play hide and seek. Great tip! My girls are super food motivated, so whenever we go to the dog park or beach I keep training treats in my pocket, make sure they know it, and they are pretty good at staying close or coming when I call them.